The makers of a “Plushie” uterus toy have had to issue a re-call notice. 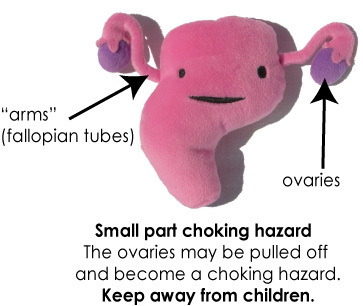 Voluntary safety recall of Plush Uterus due to potential choking hazard for children. Recall participants will receive a 15%-off online coupon code. Consumers may either return for refund/exchange, or opt-out via email if the uterus is not accessible to children. Please notify gift recipients. In an effort to ensure our plush products exceed federal and international safety standards, we learned the 2008 Plush Uterus has failed a pull test. The ovaries may detach when pulled, becoming a potential small part choking hazard for young children. No one has been harmed. Although our website and sewn-on label state that the uterus is not for children aged 0-3, we have instituted a voluntary safety recall for the uterus plush. We have filed a safety recall notice with the U.S. Consumer Product and Safety Commission (CPSC). If the plush uterus is being used by a young child, please remove it immediately. If you gave the uterus as a gift, please forward this email to the recipient(s). All other I Heart Guts plush products have been certified as safe for all ages under US and European safety standards. Once again, dawn services are being held where ever there are Australians. In every major city in Australia, as well as in many smaller towns. 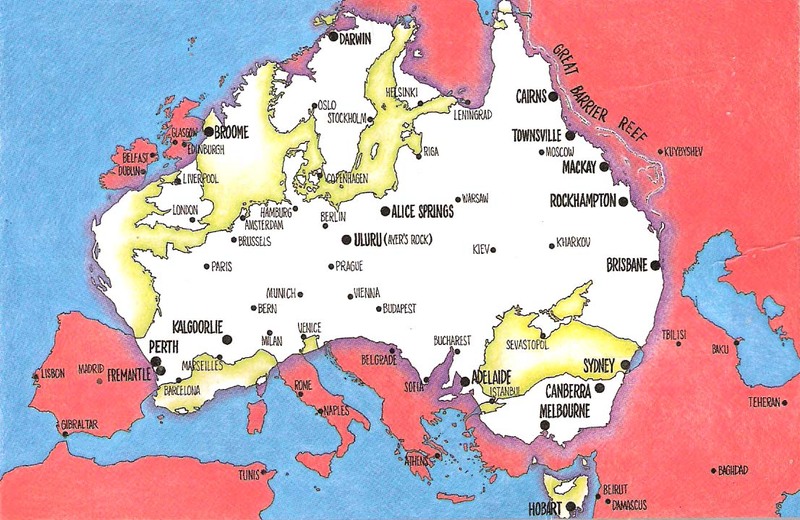 In London, in France, everywhere there are Australians and almost everywhere that Australians died in battle. Even in Turkey, on the beach at Gallipoli where the ANZAC’s, at dawn, charged into history and defeat. Perhaps it may seem strange to outsiders that our greatest hero, Ned Kelly, was an outlaw and a bushranger, and that we commemorate our greatest defeat as our finest moment. As an Aussie, it seems perfectly logical. With all the modern-day fear of those who are different, and the hysteria of modern-day terrorism, it is worth while looking back in history. Yes, the Muslim Turks were our enemies and the fighting was bitter and hard. They were commanded by the man who later became the founder of the modern Turkish Republic. Become our sons as well. This year, an Aussie whose grand-parents came to Australia from Turkey has travelled to Gallipoli with thousands of other young Aussies remembering their ancestors to remember his Great Grand Father, a Turkish soldier who fought against and was killed by the Australians. There is a lesson to be learnt here by everyone, including our leaders. Australia, You’re Standing In It! While some of my more perceptive readers may have noticed a little bit of a tug on a pedal extremity in my previous post, I thought the following may be of some interest. I rabbit on, on occasion, about my travels around this continent and perhaps this composite map may give some idea of the distances involved to those readers who have some interest in my travels or who may be interested in doing some travel themselves. For instance, don’t plan on doing Uluru and the Great Barrier Reef on the same day. Or even on consecutive days! While there is a very strong US bias in the events, this is an interesting exercise. Years later, Juan sent a picture of himself to his birth mother. Upon receiving the picture, she told her husband that she wished she also had a picture of Amal. Took a train ride from Perth to Mandurah the other day. This is a new line, opened just before Christmas. From the Perth CBD, 75 Km south to what was a major beachside holiday resort but is now an outpost of the Greater Perth Metropolitan area. Passing through new suburbs and old farmlands, the rails end several kilometres inland of the beach. There are bus links to all the surrounding areas. Just beyond the end of the tracks is a strange, already rusted, construction which is probably intended as art. I have been a fan of Tom and Jerry since I was knee high to a grasshopper. Here is one inventive mouse with a sense of rhythm and even then the fates find a way to get to him!